Garlic is one of the most powerful natural antibiotics known to man and has been used for centuries to improve the health and well-being of humans as well as animals. 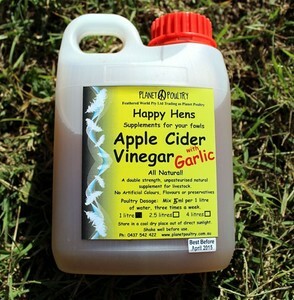 Our Apple Cider Vinegar used in conjunction with Garlic is a powerful tonic for your farm animals. It helps build immunity-fighting bad bacteria, and promote good bacteria. .trusted by tradition, proven by science . The combination of Apple Cider Vinegar when combined with Garlic can not only be used as a health tonic, but is proven to be a fly and tick deterrent when added to an animals diet. Cider vinegar is made from apples and has many uses. Feeding large quantities of apples can lead to problems but in the form of cider vinegar; stock can have proportionally large amounts without adverse effect. It is a quickly assimilated source of potassium as well as playing a great part in maintaining the correct pH body.